Noida: Apart from India, over 300 delegates from 22 countries including USA, Canada, Germany, UK, Australia, Japan, South Africa, Russia, Czech Republic, Argentina, Estonia, Indonesia, UAE, Italy, China, Saudi Arabia, Oman, Turkey, Jordan, Ethiopia, Malaysia and Bangladesh are participating in the Conference. Sh. Sanjeev Gupta, President & CEO, National e-Governance Division (NeGD) , Ministry of Electronic & Information Technology, Government of India; Prof. J Ramkumar- Professor, IIT Kanpur and IEEE UP Section Chairman, Mr. Rahul Sachdev- Head, SAP University Alliance India and Subcontinent, Dr. Kaushik Saha- Chief Technology Officer, Samsung R&D Institute, India and Prof. S N Singh- Vice Chancellor, MMM University of Technology, Gorakhpur and IEEE India Council Chair Elect inaugurated the International Conference. Welcoming the distinguished gathering, Dr. B Shukla- Vice Chancellor, Amity University thanked the delegates and speakers for coming together from different parts of the world to attend ICRITO 2017. She stressed that the focus at Amity is outcome based projects and events and expressed her hope that the discussions and deliberations during three day Conference will lead to networking, collaborations and associations, student exchange and faculty exchange programmes. 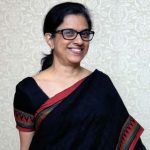 She invited representatives from Industry to come up with their problems and proposed that students of Amity can suggest innovative solutions to the same, leading to Idea Innovation in the country. Sh. Sanjeev Gupta, President & CEO, National e-Governance Division (NeGD) , Ministry of Electronic & Information Technology, Government of India shared that as per TRAI data, broadband access through mobiles is 94% in India and 300 million people have internet access out of which only 14.37% are from rural area and that’s where the country lags behind. He apprised that there are over 2,50,000 3G and 4G Towers but are not properly located. There, the concern lies in bridging this gap of people having phones but no Internet connection. He pointed out that in remote areas, there are mostly B2C services like mobile recharge, DTH recharge, buying transport ticket etc. He advised the students to be the torch bearers and integrate G2C (Government to Citizen) services in remote areas. 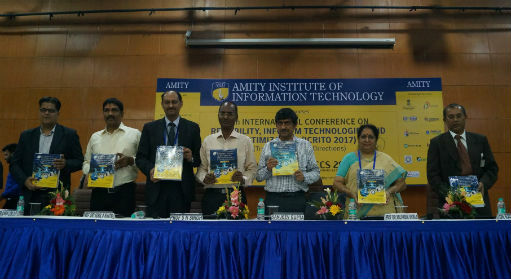 Addressing the gathering, Prof. Sunil Kumar Khatri- Director, Amity Institute of Information Technology and General Chair, ICRITO 2017 and giving a brief overview about the event shared that the Conference will focus on areas of Reliability Engineering and Optimization, Artificial Intelligence, Data Analytics, Mobile Technologies, Cyber, Information and Network Security, Cloud Computing, Human Computer Interaction, Software Engineering Testing, Information Theory, IT Applications & Networking and will lead to creation of new horizons of knowledge. He extended his gratitude to ISRO and DRDO for their support in organizing the Conference. Dr. Kaushik Saha- Chief Technology Officer, Samsung R&D Institute, India remarked that it is the responsibility of young students coming out from the colleges, with fresh ideas and new knowledge, to innovate. He lamented that most of the innovations, now- a days, revolve around developing new apps and services and resultantly, only 2% of Indian start-ups survive the break even points. He expressed his concern that the startup ideas or innovative ideas in India lack depth or analysis; the analysis actually points out the optimal way to carry out an innovation at minimum cost so that it could benefit the larger number of people concerned. He stressed that innovation will not be done by machine intelligence or machine learning alone , there will be people using the innovations and physical things will be applied. He suggested that whenever there is any innovative idea, its depth should be analyzed along with aspects of optimization and reliability. He called upon the students to expand their ideas; think beyond writing codes and machine intelligence and before up with an innovation, think about the people who will use those innovations and how they will be used. Prof. J Ramkumar- Professor, IIT Kanpur and IEEE UP Section Chairman, while sharing his views, stated that the buzz word for today is mass customization in an economical manner for which the data is needed. This data needs to be learnt through optimization which is a big challenge since it converts the data into computer understandable form. He congratulated Amity for taking up a very relevant and contemporary topic for discussion and with so many delegates participating from across the world, he expressed with conviction that new knowledge will emerge in the area of “Reliability, Infocom Technologies and Optimization” and will augment the self- learning of the engineers present.